As a Cebuano visiting Binondo, I have prepared a “to-do” list to maximize my short visit in the world’s oldest Chinatown. There are various hole-in-the-wall and family-run foodie spots in Binondo where you get authentic Hokkien food. I haven’t had the opportunity to try all the restos on my list (like Sincerity Cafe & Restaurant, Ying Ying Tea House, Wai Ying Fastfood and Cafe Mezzanine) because just half-way across our crawl, the food wall kicked in. Anyway, I will be updating this post once I revisit Binondo, as it has been my quest to try the rest of the places that I missed. Dong Bei Dumplings in Yuchengco Street is best known for their Kutchay or Pork Dumpling. 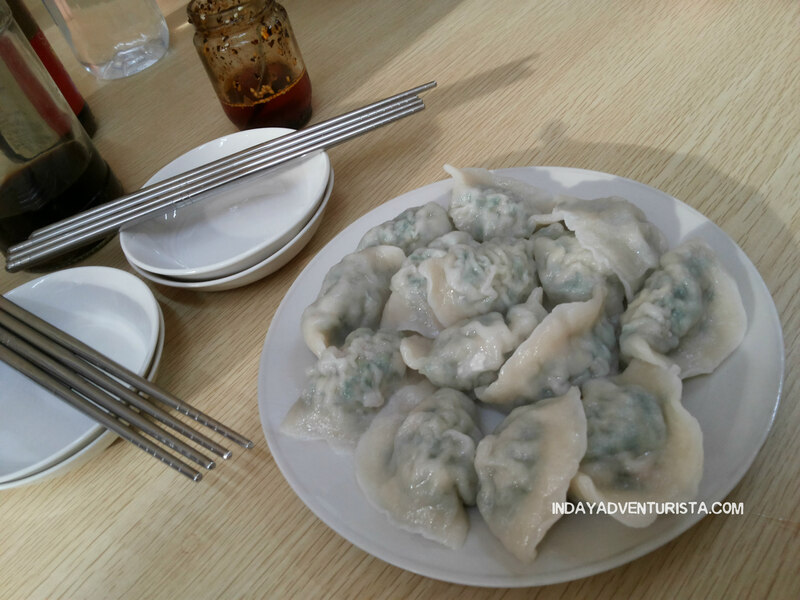 These tasty dumplings are made of kuchay (leeks) and pork. Their famous pork dumpling freshly made every day. The person assigned to make them does it openly, (like in the dining area) so you can see how it is being made from scratch. I love it and I can eat it again and again. There is a frozen version of pork dumplings available to-go, all you need to do is let it swim in boiling water and that’s it. 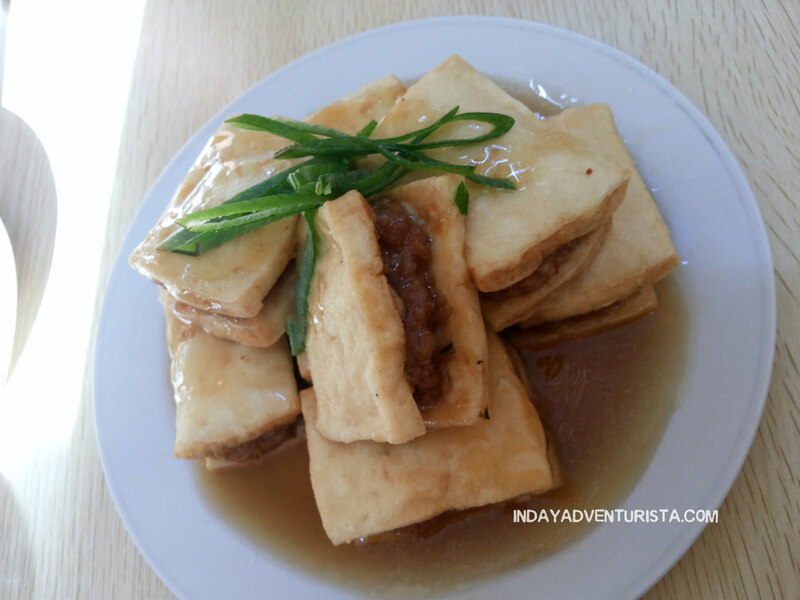 Another popular dish in Dong Bei is the Fried Bean Curd (fried tofu). I’m not really a big fan of tofu but this one I really enjoyed eating. Not to mention the sauce that came with it – it made my day! 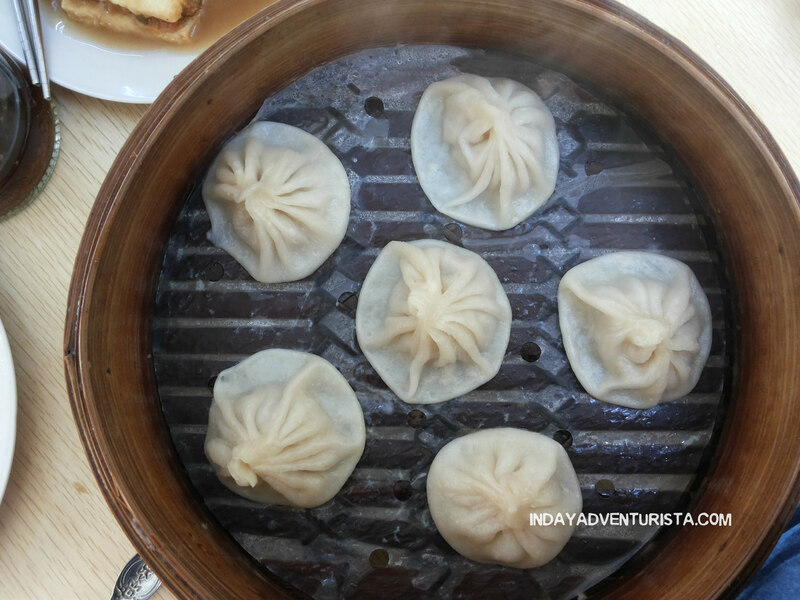 Another must try is Xiao Long Bao. For only P150.00, you get to enjoy 6 pieces of Chinese goodness. Truly worth every penny. Shanghai Fried Siopao. This unassuming little place in Ongpin Street is another foodie spot that you shouldn’t miss. 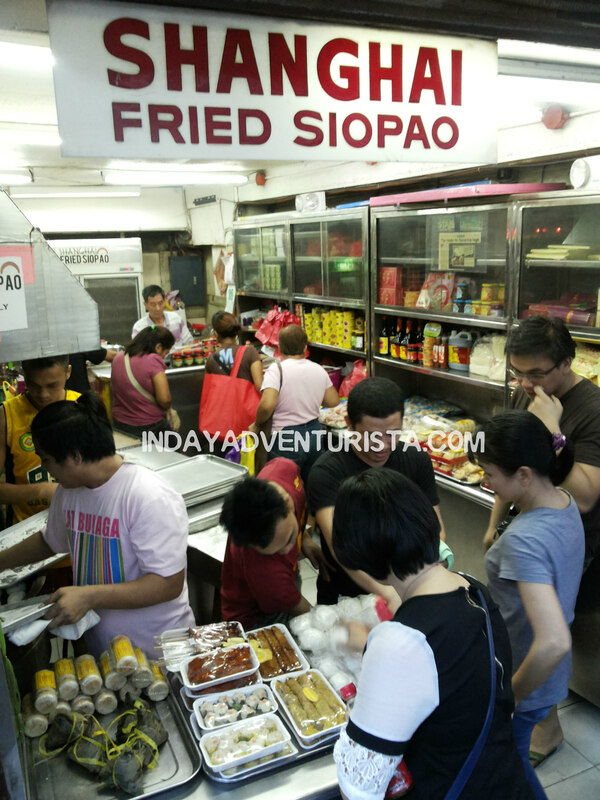 This place is popular for their fried siopao. Siopao (or steamed pork bun) is undeniably one of the more popular comfort food not only to Chinoys but also to Pinoys as well. The filling is sooo good, I bet you, too, can finish more than one bun. 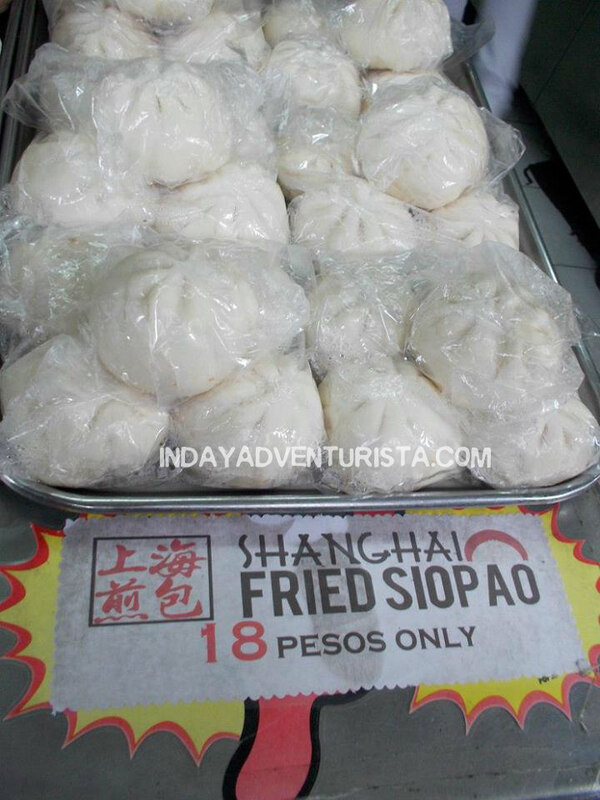 Aside from this, Shanghai Fried Siopao also offers other goodies like hopia, tikoy, siomai and much more. If you are looking for a place where you can buy packed Chinese eats, you might want to consider checking them out. You’ll surely won’t not leave this place empty-handed. Lan Zhou La Mien. Tucked cozily at Benavidez Street, Lan Zhou La Mien serves traditional hand pulled noodles that’s so alluring, you definitely can’t resist. A glass window is available for customers to clearly see the dedicated noodle guy assigned in hand pulling the noodles from scratch. It made me appreciate the efforts exerted to create my noodles in the old fashion way. During our first visit, we had Beef Lamien (P140.00) and Pork Lamien (P140.00) without knowing that their serving is HUGE, we hardly finished our own bowls! Therefore, on my second visit in 2015, there were there of us only had Beef Wanton Lamien (190.00) but still, we can’t barely consume one bowl. I suggest you order 1 lamien per 2 persons so that you can try other noodles from their menu. Their lamien is a two-thumbs-up in terms of taste. Buuurp! I will update this blog once I visit the other restaurants I mentioned above. This time, I will make sure I visit Binondo with an empty stomach so that I can eat as much as I want. Chinatown in Binondo is truly a food basket for all foodies out there. The best way to shop in Binondo is by haggling and scouting for amazing bargains. If you are the kind of person who digs affordable items that are very usable (and worthwhile) have a shopping spree in Chinatown. Ongpin Street has all the shops you could ever need flowing with great finds at bargain prices. You’ll be surprised by a growing selection of products and brands typically found only in Chinese stores. There are furniture shops, school & office supply stores, hardware, jewelry shops and bakeries. These shops are selling items at half the price compared to major malls in town. For the best grocery and convenient store buys, check out Eng Bee Tin and Ho-Land Hopia & Bakery for an amazing variety of freshly packaged Chinese goodies, canned goods, instant noodles, hopia (mooncakes) and other delicacies. In addition to the traditional faves, you can also find oriental food selections only at here in Binondo. There are a bunch of historical sights and scenes in Binondo. I am amazed by the old deco-style buildings in Escolta, and the magnificent infrastructure mixed with the old. There are several places of worship in the area, like temples and Churches. Some of the temples in Binondo are the Buddhist Temple, Kuang Kong Chinese Temple, and Seng Guan Temple. The most prominent Church, of course, is Binondo Church (formerly known as Our Lady of the Most Holy Rosary) located in the business district of Binondo. Founded in 1596, this house of worship is loosely based on the St. Peter’s Basilica in the Vatican. 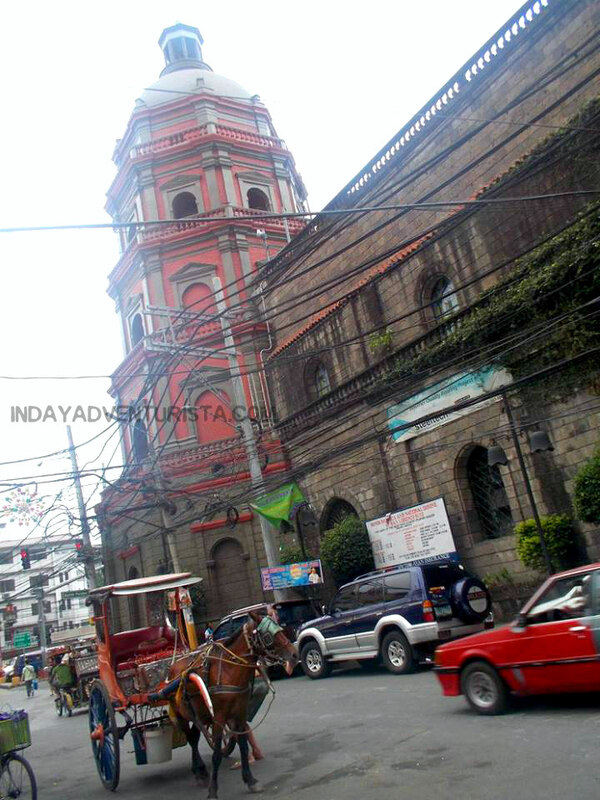 Binondo Church is located right across Plaza San Lorenzo Ruiz (originally called the Plaza de Binondo). Marked with a fountain and statue of Lorenzo Ruis, this major square is considered the center of Binondo as a whole. Binondo Chinatown Arch at the entrance from Jones Bridge is hard to miss with three pagoda designs. It was inaugurated on June 2015 and is said to be the largest Chinatown arch in the world in terms of dimensions. 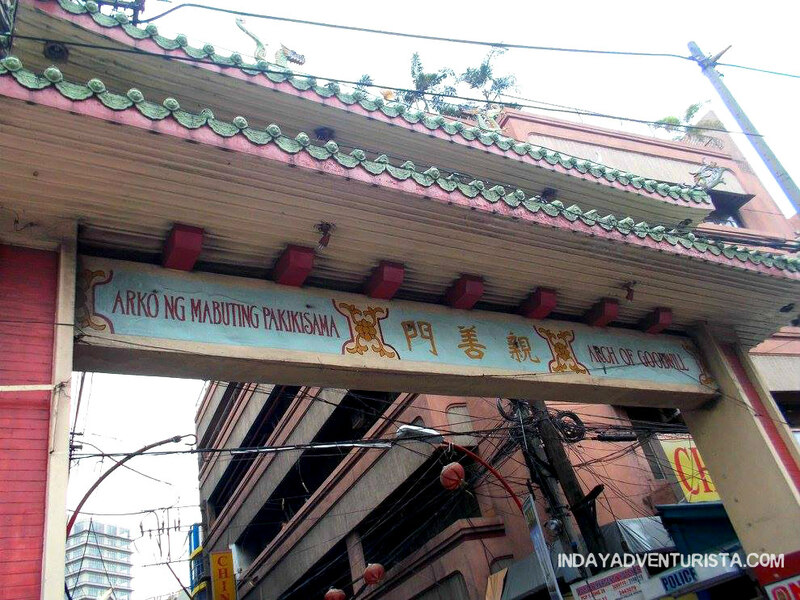 Arch of Goodwill at the end of Ongpin st. symbolizes HOPE and goodwill between the Filipinos and Chinese community. Filipino-Chinese Friendship Arch serves as a gateway to Chinatown if you’re coming from the south and celebrates the friendship between the Philippines and China. Ongpin North Bridge Arch can be found near along the street of Estero de la Reina and Estero de San Lazaro. This is where the so-called creekside restaurants can be found. Sta. 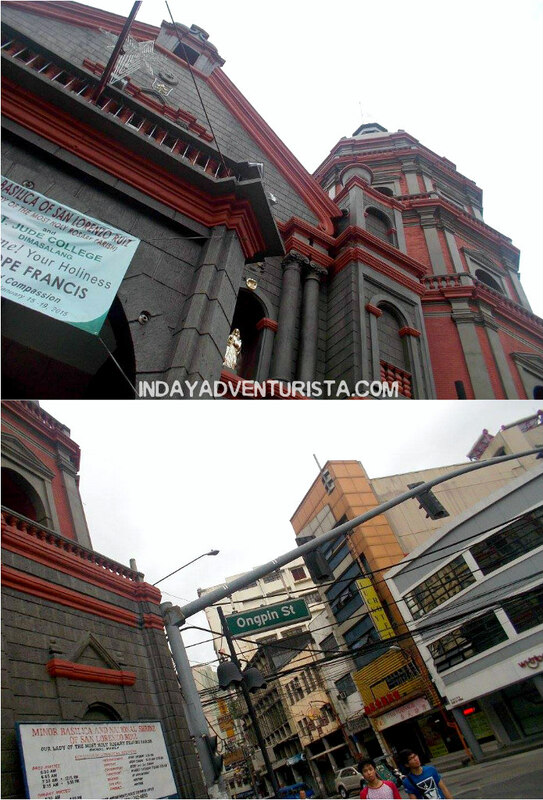 Cruz Church in Carriedo St, Binondo, Manila is a Mission-style Church built in the 1600’s. **The church architecture employs a California Spanish Mission façade silhouette with the usual Filipino (Asian-Hispanic) baroque ornamentation. The church facade is topped with an effigy statue of Our Lady of the Pillar, the patroness of the church whose feast happens every 3rd Sunday of October**. This is conveniently placed within Plaza Santa Cruz where the Carriedo Fountain is. The Carriedo Fountain is a beauty. It was said that the fountain has been moved three times before. It, now, marvelously placed in the plaza, across Sta. Cruz Church. Ongpin Street is home to many restaurants, groceries and Chinese herbal and souvenir shops, including charms, and Feng Shui items. It’s another go-to place, especially during Chinese new year season. Lucky charms will be blessed with incense burning for good luck. Souvenir items and gift ideas are widely sold in gift shops across Binondo. 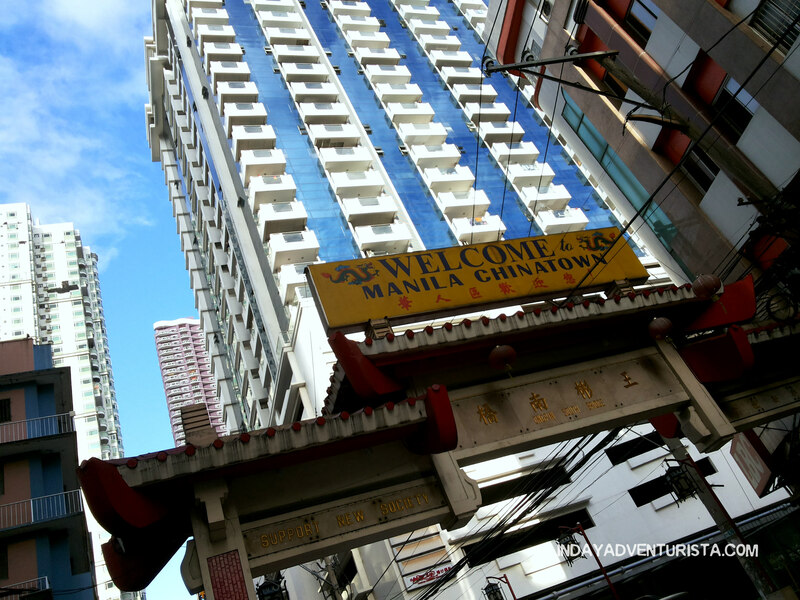 There are still a lot of things to do in Manila, Chinatown or Binondo as a whole. If you’re a budget shopper, a foodie on the lose or simply a wanderer, you’re in for a treat at Manila’s central “thrift” district. If you want to stretch out your food and shopping adventure, you may also visit neighboring areas like Divisoria, Tutuban, and Quiapo.